While I adore my iPad and all the adventure games I’ve played on that nice big screen, my first love is still my iPhone. It’s basically glued to my hand, so by default any games that easily play with one hand in portrait mode are going to get more of my attention. And that means that I’m always on the lookout for relaxed, endless puzzle games that can be played anywhere and anytime, especially while multitasking. It may seem like the App Store is full of high score chasers like that, but the reality is that most of them are tainted with opt-in ads and IAPs that help you get ahead. It’s becoming rarer and rarer to find games like this that are both satisfying to play and also free of any artificial boosters. For a while now, Six Match has been that game, but I’ve been trying out plenty of new ones to replace it. Then along comes Slydris 2, and I can’t stop playing. I’m not sure why, but I never played the original Slydris until today, for the sake of this review. In it, you slide square and rectangular blocks side to side so they drop into gaps below them and form lines so they can clear. 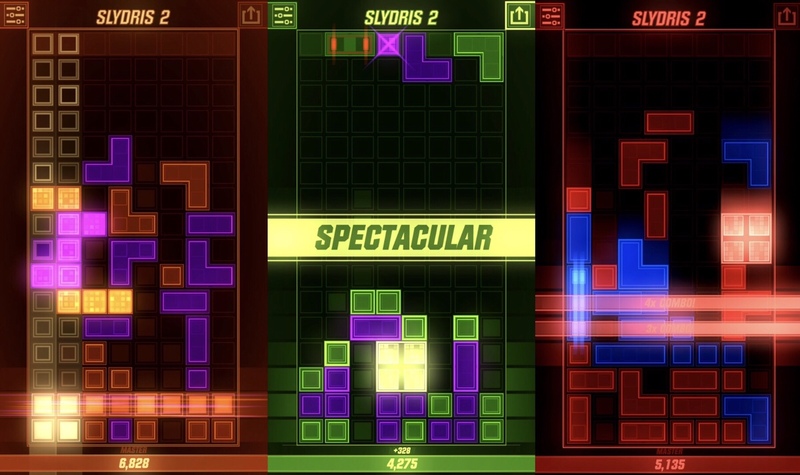 Yes, it sounds a lot like Tetris, and that’s not by accident, as you can probably tell from its name. It borrowed ideas from the popular game but made them fit better on a touchscreen. It’s a pretty decent endless puzzler, but after playing the sequel, it feels very dated. That said, if you liked the original, grabbing this new one should be a no-brainer. Slydris 2 looks and feels very familiar, but that’s not a bad thing. It takes most of the mechanics from the first game and makes it even more like Tetris. Instead of just simple flat shapes, now we have L-shapes, four-block squares, and even tall columns. Not all the Tetris pieces are here, but there’s so much going on you might not even notice. First off, this is a turn-based game, so you can take as much time as you need to think out each move. You have the option to either slide one of the hanging pieces that are about to drop or slide one of the pieces already on the board. The only rule is that you can’t move a piece if another one is in its way and you can only move one piece per turn. As with Tetris, you need to keep an eye on both the bottom of the screen and the top, as it’s game over if any pieces touch the top of the screen. There’s a lot of strategy involved, as you get more points if you create combos of multiple rows in the same move. You also get extra points if you make a row of a single color. So instead of going for one easy row at a time, you may want to play it a bit riskier and set the board up for bigger combos. To help with this, there are also blocks that, when matched, cause all the other blocks of that color to crumble into pieces, making them easier to match. On top of that, you have the four-block square that breaks apart the blocks it lands on. It also breaks apart everything above and below it when it’s matched. Then there’s the three-block column that clears three rows at a time if you just match it with one. And in case this all sounds too easy to you, remember that multiple blocks fall at once, and they can pile up pretty quickly. There are also blocks that you can’t move, which can really mess up your plans if you’re not careful. But the turn-based nature of the game means you can take your time and mitigate your luck. You might even turn a hopeless situation into a high score. In fact, the most satisfying moments are when I’m almost sure that I’m about to lose and instead I manage to make a move that clears up half the board and racks up three hundred points. Watching all those blocks fall and clear, row after row can be mesmerizing and addictive. Speaking of visuals, they’ve really been beefed up here. While the mechanics are certainly strong enough on their own to hold my attention, it doesn’t hurt if a game is easy on the eyes. And as you can probably tell from the video and screenshots above, the graphics got a huge overhaul and are now super slick, full of dazzling special effects. It’s actually physically painful for me to look at the original game after spending so much time with this beauty. There’s also five different color schemes that you can either set to randomize or choose your favorite. And there are five different music tracks to go along with them. This means that even if you’re playing for hours, your eyes and ears won’t get bored. On top of all this, the game is very mobile- friendly, as you can quit any time and it autos save your progress. The monetization is fair, too, as you can play for free and watch the occasional ad or pay once to remove all ads and make the game fully premium. There’s no option to watch an ad to continue or to earn power-ups or upgrades or any other sort of leg up. This is as pure as you can get with a high score chaser, as you can only rely on your own skills and strategy. And if you prefer to get your adrenaline pumping, there’s a speed mode that forces you to act quick before the blocks drop on their own when the timer runs out. It’s not really my thing, but it’s nice to know it’s there if I ever need a change of pace. 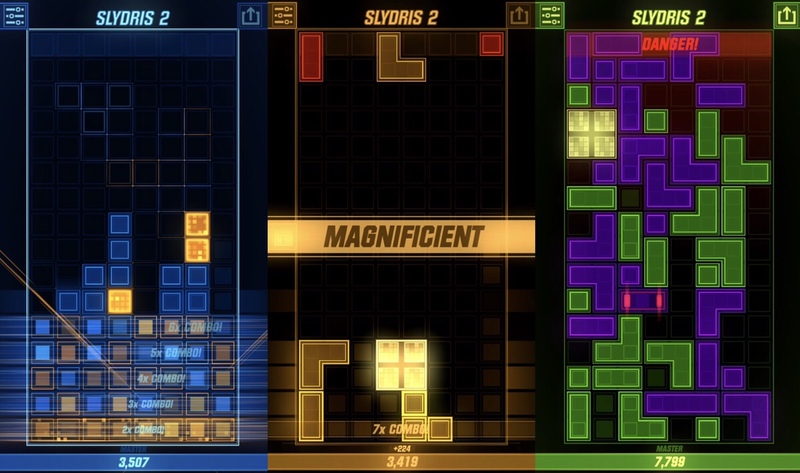 Slydris 2 is exactly the kind of game I’ve been waiting for and I’d recommend it to any puzzle fans or those looking for a new high score chaser to eat up all your time. This here is the real deal, a game that might have existed before all the free-to-play junk took over the store. I’m so glad we’re still seeing gems like this, even if they’re super rare. So grab the game here for free, and if you like it, please support the developer so we might see more in the future.